Tried everything to shift those stubborn bumps on your hips or inner thighs? The Cooltech Fat Freezing treatment can get rid of them fast and easily. It doesn’t matter how much you exercise or how well you eat, there are just some parts of the body where stubborn deposits of fat can form. But you no longer have to live with them or even tame them with Spanx. Cooltech treatment can make a remarkable difference to your figure, leaving you looking more svelte and feeling better than ever before. It’s a big word cryolipolysis, but it’s a term with which anyone with hard-to-budge bulges should acquaint themselves. Subcutaneous fat cells in a certain part of the body are cooled and effectively frozen so that the body can eliminate them. In just one session, 25 per cent of the fat cells in the treatment area can be removed. These types of treatments aren’t exactly new, but Cooltech is thought to be more effective – and it’s less expensive – than similar techniques. 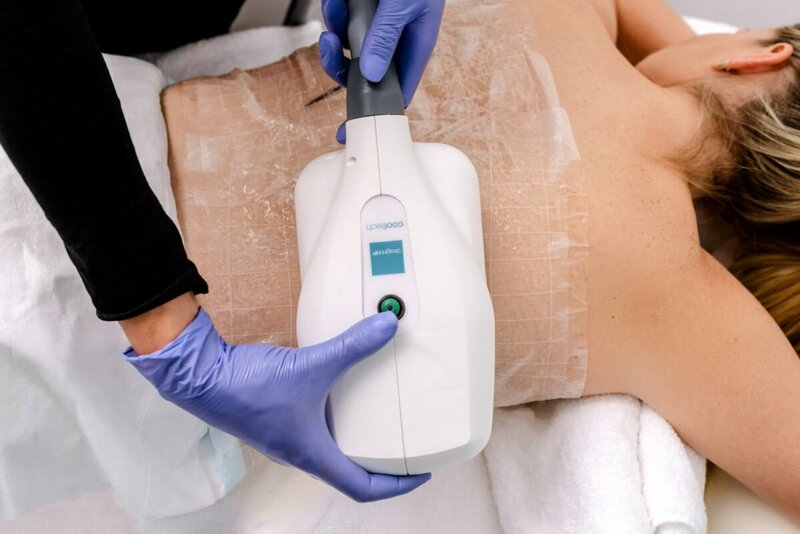 Using a non-invasive technique, fat cells are permanently removed from trouble areas. Saddle bags around the hips, muffin tops, bulges over the bra strap, tuckshop lady arms, turkey neck… All can be reduced during a walk-in, walk-out treatment performed in the clinic without anaesthetic. There’s no downtime and some changes will be almost immediate, but the best results can usually be seen two to three months later. Every body-shaping treatment at The Harley Clinic starts with a full body scan and is tracked over the duration of your treatment. From the scan we obtain a full 3D image of the body (yes, we get that in just 40 seconds!). This scan captures your exact measurements, including everything from your body’s circumference, lengths, contours, widths, surface areas and volumes. By obtaining these measurements and information, progress can be properly tracked and, in turn, make your goals a reality! Applicators, which come in six different sizes and shapes are used to conform to different areas of the body, are applied to stubborn fat deposits. They gently draw the fatty skin in (the surface of the skin is protected throughout the procedure by gel pads), before cooling it to the desired treatment temperature of between 3ºC and –8ºC. This triggers apoptosis (death of the cells). A clinician will massage the area to break up and separate the frozen fat, which the body then eliminates through natural processes. None of the surrounding tissue is affected and those fat cells are permanently removed. There is none. The treatment takes between 60 and 70 minutes and you can leave the clinic straight away. The only effect you might see is a slight reddening of the skin (from the suction and the cold), but that will soon disappear. You will see some changes immediately, but because the body has to eliminate the dead fat cells the best results can usually be seen a couple of months later. The good news is that once the fat cells are treated and removed from an area – and just one session can reduce them by 25 per cent – they will never come back. Is there anyone this won’t work for? Cooltech isn’t a weight-loss technique, nor does it help someone who has lost a lot of weight and now has rolls of skin (this requires a skin-tightening treatment, also offered by The Harley Clinic). Think of it as non-surgical liposuction. And while fat won’t return to the treated area again, should someone gain weight after the procedure, fat will be deposited elsewhere on the body. What parts of my body can I treat with Cooltech? Most people have Cooltech on the waist, hips, inner thighs, above the knees, jowl, back and upper arms. The treatment itself is pain free. No anaesthetic is used and you can leave the clinic immediately after your treatment and continue your normal daily activities. Following treatment you may experience inflammation and numbness in the area for a week or so, however this is all a normal part of treatment as the fat cells begin to die and leave the body. Can the suction or cold affect my skin? No. The skin’s surface is protected by gel pads throughout to procedure to avoid damage. This entry was posted in Non-Surgical Liposuction. Bookmark the permalink.